Food, Music and Life experiences for the week. Ready to jump in? Here we go! A vintage Graham Kerr Galloping Gourmet Cookbook! 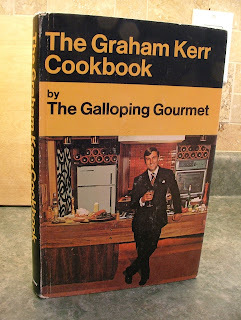 If you're not familiar with the Galloping Gourmet, it was a cooking show that aired on TV in the 70s. The host was Graham Kerr who would literally gallop into the show at the beginning. He would also consume a good amount of wine as he cooked. I'm not entirely sure he even knew what he was doing. I used to watch re-runs as a kid because I thought the guy was a riot! Here's a taste of the show. For Graham Kerr incidents like this were all part of the cooking experience and the show. I've already started digging through this cookbook to see if I can find a few choice Galloping Gourmet recipes to share on this blog. Stay tuned. Last Sunday the Juno Awards were held in Ottawa Canada. The Junos are the Canadian equivalent of the Grammies minus the glamour and flair. Like most years, I didn't watch it...I find award shows boring. However I was surprised to learn Michael Bublé won album for the year for...get this...a Christmas album. WTF! For full disclosure I've never listened to Bublé's Christmas album and my bet is it's probably very good...the guy can sing. I just think Christmas albums should only win Christmas album awards not album of the year awards for one simple reason...Christmas songs are listened to for 2 months not for the ENTIRE year. Does that make sense? Oh well, good for Michael. I'm currently reading The 7 Habits of Highly Effective People by Stephen R. Covey. 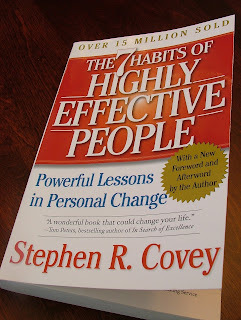 There's a topic the author hits on early in the book which is about "the quick fix" so many of us (myself included...especially during university) have often tried employ to solve our dilemmas. This quote from the book has convinced me to never look for a quick fix again. "Did you ever consider how ridiculous it would be to try to cram on a farm-to forget to plant in the spring, play all summer and then cram in the fall to bring in the harvest? The farm is a natural system. The price must be paid and the process followed." This really hit home for me because last year I entered a triathlon and did just enough swim training (I'm a terrible swimmer) to complete the swim section of the event. I came out of the water 50th of 52 in my age category. As you can see the "quick fix" allowed me to finish the swim but not very well. This year I've been paying the price in the pool, going twice a week and following a specific program. I'm already swimming more lengths of the pool than I ever thought I would ever be able to do. Shortcuts might get you by in the short run but often they end up taking you down the longer and harder path to true mastery of whatever you are trying to achieve (including learning to cook).